Lead dancers on the yagura during Mountain View Buddhist Temple’s Bon Odori. MOUNTAIN VIEW — Mountain View Buddhist Temple, 575 N. Shoreline Blvd. 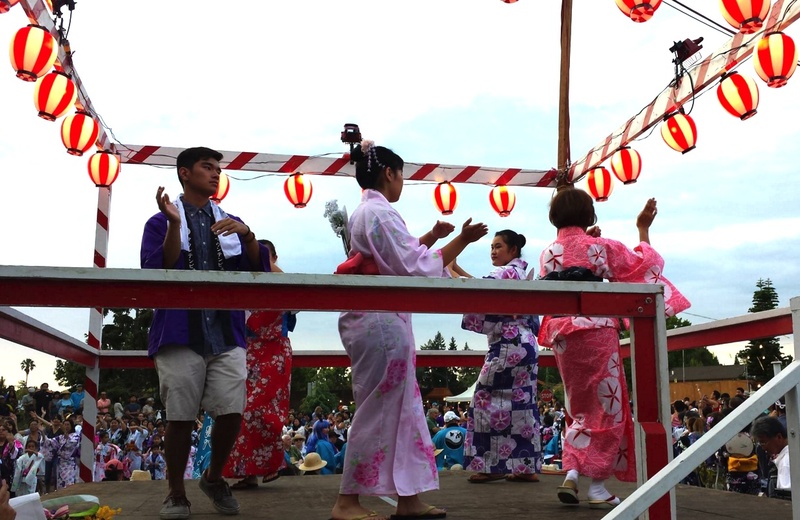 in Mountain View, will hold its 2016 Obon Festival and Bazaar on Saturday, July 16, from 4 to 10 p.m. and Sunday, July 17, from 12 to 9 p.m.
New this year, there will be dancing on both nights. Maui-style Bon Dance is on Saturday at 8 p.m.; Bon Odori is on Sunday at 7 p.m. Final Bon Odori practice will be held Tuesday, July 12, in Sangha Hall and Thursday, July 14, outdoors, both at 7:30 p.m. Maui Bon dance practice will be on July 12 in Sangha Hall and July 14 outdoors, both at 8:45 p.m. The festival will feature food, games/prizes, exhibits, Buddhist books, a flower shop, homecrafts, children’s crafts, MVBT Taiko and other entertainment. For more information, call (650) 964-9426 or visit www.mvuddhisttemple.org.